I was on vacation in Kerala, so that took up some of my time, and I was unable to post. It’s at times like these that an editorial calendar and banking lots of posts for a rainy day helps. I’ll be sharing some of those pictures and a recipe tomorrow. Living in Bombay means making do with small spaces and cooking out of small kitchens. 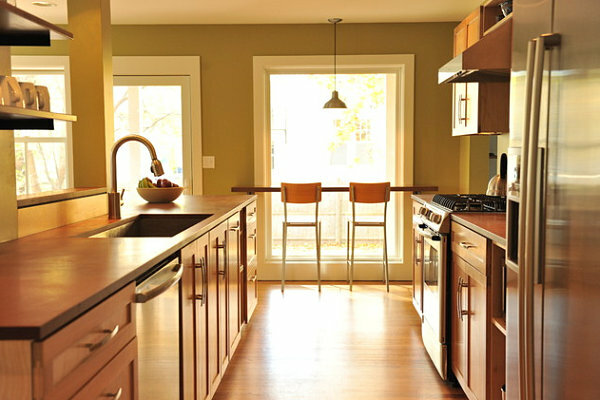 But, like many other people put there, I do have my own little vision of a dream kitchen. And I never pass up a kitchen tour online! 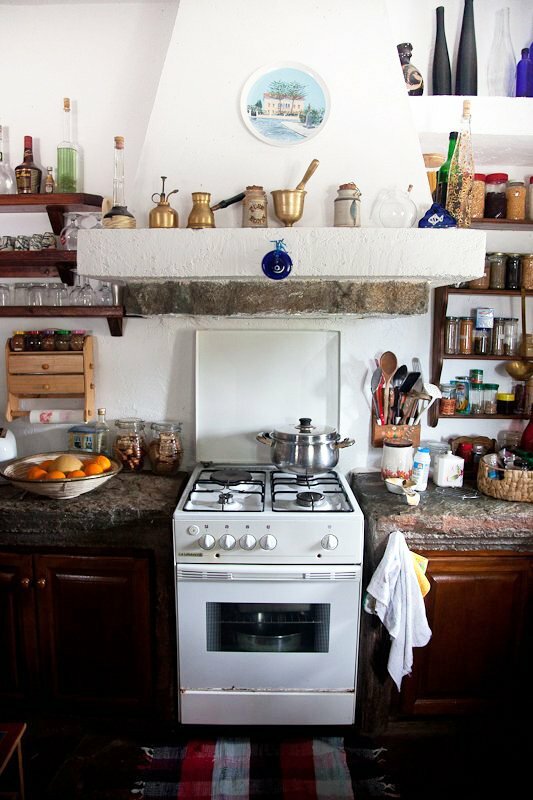 I wouldn’t mind white stone interiors like this cottage kitchen in Greece. So naturally beautiful! When I do build my ideal kitchen one day, I sooo want to have a breakfast bar like this one. Another cute kitchen is from this bed and breakfast in the movie Leap Year. It’s a fun movie, starring Amy Adams and Matthew Goode, following the two as they trek from one spot in Ireland to the next. I loved the decorative plate-wall in the kitchen of the little bed & breakfast they stayed in. And the lovely Grace from Design*Sponge had pictures! And I love this tour of Food52 founder and writer Amanda Hesser’s NYC kitchen. What I love most? Her chopping station, designed specially to accommodate her petite frame. From kitchens to the pros who inhabit them…quick snapshot of celebrity chefs and their take on food trends from the Los Angeles Food & Wine Festival courtesy Popsugar. Cronuts were much discussed! And I know I may be waking up a little late to the Momofuku Milk Bar phenomenon, but I have to admit Christina Tosi is my new girl crush. Anyone who can add potato chips and pretzels to a cookie is some kinda awesome. Protein has a fun video. And last, but not least: 2 books I’d like to get my hands on. Perfect by Felicity Cloake and Cooking For Mr Latte by Amanda Hesser. so glad to have you back & blogging! looking up the books now, and about to find out what milk bar is? That white stone kitchen is gorgeous! How fun would it be to cook there? I know! It really is gorgeous. And it sits atop a hill in Greece! You should check out the entire slideshow on The Kitchn. It’s really beautiful! OHMYGOODNESS! I’m having a major “the world is so small” freak out moment. I’ve actually been on THAT island WITH Aglaia Kremezi who gave the writer of that article a tour of the house! WOAH.